Famed concertmaster and esteemed soloist Steven Staryk performs brilliantly enough so that light from the Staryk Galaxy permanently illumines our musical skies. Considered the “King of Concertmasters,” Steven Staryk (b. 1932) has been concertmaster of four of the world’s major orchestras: the Royal Philharmonic of London, the Amsterdam Concertgebouw, the Chicago Symphony, and the Toronto Symphony. This Canadian-born violinist was the youngest concertmaster in the history of the Royal Philharmonic of London when he was appointed by Sir Thomas Beecham in 1956. Staryk has since toured Europe, the Far East, and North America as soloist and founding member of Quartet Canada. More than 190 entries in the Creighton violin discography rank Staryk among the world’s most prolific recording violinists. Anyone who has ever owned or played the Beecham recording of Rimsky-Korsakov’sScheherazade has awed at and pondered over the talent of this master of his instrument. To be quite blatant about it: the performance of the Paganini Concerto (live January 1969) has to rank of among the most intensely blistering virtuosic renditions in my experience. Not only are the usual technical accoutrements of this concerto realized, but the very acoustic of the North German Radio venue contributes to the stratospheric aura of the high notes, trills, and harmonics, the “shooting for the rafters” effect. His instrument, the Muntz Strad of 1736, perfectly fit’s the music, especially given the virtues of the first movement cadenza, a composite of Sauret and Wilhelmj as arranged by Staryk himself. If the Paganini might be construed as relatively “shallow,” pyrotechnically superficial music, try Staryk in the time-tested classics by Beethoven and Mozart. The Beethoven (18 September 1961, for Santa Caecilia Day) with the ever-architectural molder of orchestral sound, Haitink, enjoys a singular breadth of vision I would have attributed to the famed Grumiaux/Beinum and Schneiderhahn/Furtwaengler conceptions, Apollinian and grandly conceived in the symmetrical periods that mark this work’s innate nobility. Staryk’s chosen instrument for the Beethoven is the Hochstein Stradivarius of 1715. The Mozart (rec. broadcast live, 1972) immediately moves with streamlined felicity and blazing speed and accuracy. The instrument here is the Baltic del Gesu of 1731, spins out the lush melodies of the first two movements in seamless silver thread. The high-mindedness of the opening movements in no way cheapens the stunning effects of Mozart’s janissary impulses that spice the last movement to such excellent, vital appeal. The Joachim cadenzas impress not as anachronisms, but as tender and affectionate responses to the melodic tissue. This is a performance of girth, wit, and genial spontaneity in all parts. The familiar Aragonese jota, Saint-Saens’ Introduction and Rondo Capriccioso (rec. London, 1962), has always set violinists in pursuit of Heifetz’s virtually ideal realizations. Staryk comes as close as anyone, bringing a taste of gypsy intent for its intended dedicatee: Pablo de Sarasate. Here, Staryk rivals the no less seamless artistry of Ruggiero Ricci in this delectable Iberian evocation by a master of French classical taste. At 4:40 there is a decided sonic shift in the quality (microphone placement) of the recording, however the music remains intact. The 1948 Concerto in A Minor by Dmitri Shostakovich illuminates Staryk’s art in another light entirely. Here, plying his ex-Barrere Stradivari of 1727, Staryk and conductor Andrew Davis (rec. 1986) engage in a series of meditations on life’s bitter struggles and eventual moral conquest of adversity. The opening Nocturne projects a singular, anguished expressiveness, certainly laid out on a scale resonant with the famed Oistrakh accounts with Mravinsky and Mitropoulos. The exquisite lyricism of Staryk’s violin immediately makes us wonder what his conception in the Berg Concertomight offer. The fascination with the macabre enters into the second movementScherzo, a coarsely rasping dance in quadruple time that invites intrusions from the winds and brass. The processional Passacaglia offsets the wildness of the Scherzo, incanting in a slow and solemn (Spanish) idiom that has the Staryk’s spinning out a long sweet melody that culminates in the extended, Bach-like cadenza that serves as a transition to the last movement, Burlesque (Allegro con brio). The Toronto Symphony battery turns on the ironic juices for this pagan movement whose dervish energies often recall Khachaturian as much as they do the savage gloom of Shostakovich. The consistent virility of execution sends both music and audience into another dimension, followed by demented applause. In the course of a very active international career, Steven Staryk was the “King of Concertmasters” and a prince among teachers. He was also among the greatest masters of the violin that we have witnessed in our time. Now that he has recently celebrated his 80th birthday (b. Toronto, 1932), it’s time for a retrospective, like the one Centaur Records has just culled from the artist’s own 30-CD archive of selected recordings. When you hear the selections on the present 2-CD set, you will probably wonder, as I did, “Where has this guy been all my life?” Recognition by the general public of an artist whom the British magazine Gramophone proclaimed “among the great ones” has been incredibly slow in coming. His technique and artistic temperament were never in doubt. 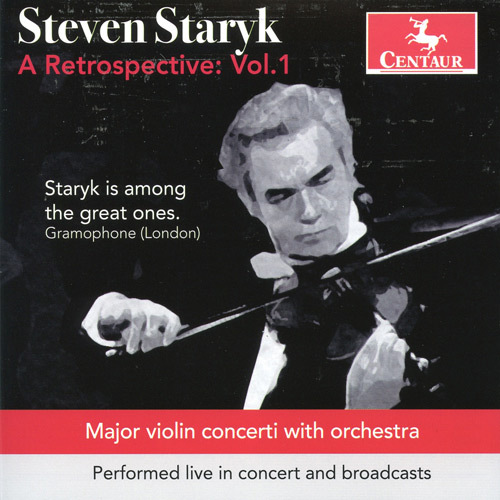 Staryk attacks the five major works heard on the present program boldly, with the greatest assurance, fortified by his marvelous bow control (witness the sensational spiccato bowing in the opening movement of the Paganini Concerto in D) and the impeccably clear stopping he employs in the riotously fast finale of the Shostakovich, to give just two examples. He was the absolute master of the moods, tempo fluctuations and tonal shadings in the works he performed. In two of the best performances on this program, the Beethoven with the Royal Concertgebouw of Amsterdam and the Shostakovich with the Toronto Symphony, he had the additional advantage of having been concertmaster of these orchestras, so he had an insider’s view of just what to expect from a conductor and ensemble to a degree that a guest artist never does. To say that the performances in this 2-CD set are “bold” would be an understatement. Staryk pushes the limits of bravura to the point where it is dangerously close to excess, but he never lapses over to that extreme. In the opening movement of the Mozart, and particularly in the Paganini, knowing the difference is critical. In the latter, the extended use of double-stops, both chromatic and in harmonics, is one remarkable feature. Another occurs in the opening of the third movement, where Paganini calls for the violinist to play a rapid downward scale A-G-F#-E-D, both bowed and pizzicato, on an open D string. And the composer’s famous bel canto style is very much in evidence in this performance. Even the orchestra seems inspired by Staryk’s presence. You’d expect playing like you hear on this disk from a major world orchestra such as the Concertgebouw or the Toronto, but the North German Radio Orchestra, under a conductor with whom I was totally unfamiliar, really surpass themselves here. One more example of Staryk’s prowess, and then I’ll give my fingers a rest before I wear them to a nub. The Shostakovich Concerto No. 1 in A minor requires utmost concentration from both violinist and orchestra because of its deep, pronounced and fluctuating moods and its demand for high energy playing for long stretches at a time. There is a special challenge for the performer to make it palatable to the listener because so much of this music is dire and pessimistic. That is especially true of the first two movements, an opening Nocturne marked by waves of fear and trembling (I got a mental image of Edvard Munch’s famous painting The Scream while listening to this movement) and a grotesque Scherzo based on a sarcastic dance in quadruple time. The turning point of the entire work is the Passacaglia, in which the mood changes slowly to one of calm, assured resolution . Of the greatest emotional depth, this movement challenges the soloist with its long, pure, expressive melodies requiring seamless artistry all the way to the end of a bowing, and an extended cadenza that leads us right into the high energy finale, titled Burlesque. The music here is raucous, in a mood of levity marked by impudence that is nonetheless a form of celebration and life-affirmation. In this work, Steven Staryk has some of his best moments. "…not only a great violinist, but a great artist."